All our new construction and refurbishment projects are to achieve sustainable design standards – following our own in house specification for new building design and SKA Gold for refurbishment projects. We're retaining and advancing further our existing leading national and international position as the sustainable university – by developing an innovative and cutting edge sustainable campus infrastructure. We have a continual process of campus development, involving refurbishment and maintenance. Achieve our own in house specification for sustainable design for new construction and SKA Gold for all refurbishment projects from 2019. Design out waste where possible and target zero waste to landfill for construction projects. Protect and enhance local biodiversity on site. Install – where possible – new design renewable technologies, including natural ventilation, solar shading, solar hot water, photovoltaics and rainwater harvesting. Install SMART meters on all new builds. Wellbeing Centre – opened in 2014, and designed to BREEAM Excellent. The House – our new performing arts centre, opened in September 2014 and built to BREEAM Excellent. Marine Station – opened in 2014 and designed to BREEAM Excellent. Marine Building – opened in 2012, built to BREEAM Excellent. Exeter Dental Education Facility – opened in 2017 and built to SKA Silver standard. 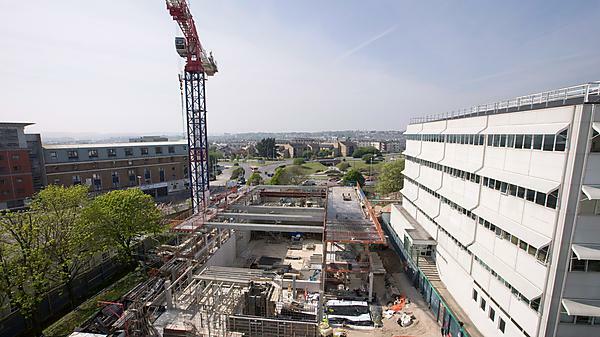 Derriford Research Facility – opened in 2018 and built to BREEAM Excellent. The materials used were responsibly sourced and included at least 25 per cent recycled aggregate, whilst 70 per cent of construction waste was diverted from landfill and recycled or reused. The occupied spaces make use of natural daylight. The electric lighting is controlled by proximity and daylight sensors. External lighting is energy efficient and controlled to only come on during night hours. The building's occupied spaces are cooled by natural ventilation. There's a 20,000 litre rainwater harvesting tank to supply the toilets, whilst sensor-operated taps and low flush toilets reduce water use. Voltage optimisation controls the power supply to the building - reducing energy and power demand. Discover more about The House. Opened in October 2012, the Marine Building is built to BREEAM Excellent standard. The Marine Building is an example of sustainable construction whilst housing cutting-edge facilities for marine research – which in itself will include renewable energy research. The building uses the sun's energy to heat hot water via solar thermal hot water technology. Harvested rainwater supplies the toilets. The building has low energy LED lighting and lighting sensors – reducing energy use from lighting. Opened in 2008, the Roland Levinsky Building achieved BREEAM Very Good rating. It incorporates a copper wrap exterior for longevity, as well as recyclable properties and exposed concrete walls to provide thermal mass to maximize temperature control. The roof uses roof lights to flood the atrium with natural light, and is home to a 6,000 litre rainwater harvesting tank that supplies the toilets. A 2.2kW photovoltaic system powers the lighting in the cafe, which is also surrounded by Pilkington Suncool glass to reduce solar gain. The remaining lighting consists of low energy LEDs operated by proximity sensors for lighting control. The lecture theatres have separate air handling units to provide air conditioning only when needed. The building uses the cross point atrium space to utilise a low energy ventilation system, where fresh air is drawn into the building through below ground level air ducts. Opened in 2014, the £4.65 million development provides a base for our marine expeditionary work. The building includes photovoltaics, generating electricity from the sun and has its own Combined Heat and Power (CHP) boiler, providing electricity and hot water for the heating and showering facilities, delivering savings in utility costs for the building. CHP generates electricity whilst capturing usable heat that is produced during the process, usually a by-product in conventional boilers that is wasted. Discover more about the Marine Station. Our sustainable buildings reach beyond campus. The Health and Wellbeing, Pool and Tremough Innovation Centres are all built to BREEAM Excellent standard, incorporating biomass boilers, natural ventilation systems and rainwater harvesting. And they all use locally sourced building materials. Both the Pool Innovation Centre and the Peninsula Dental School based in Plymouth's Science Park have photovoltaic cells to generate electricity from the sun, as well as a green roof to aid biodiversity and reduce heat gain in the building. To find out more about the University’s sustainability activities and the technology in use on campus, how about taking a tour on the interactive sustainability trail.